Among the truly great experiences in life, few can beat standing atop the “Mountain of Greatness.” Mount Kilimanjaro is not only the tallest freestanding mountain in the world, it is the highest peak of Africa and, best of all, it is the most accessible to walk of all the great mountains on this planet. To help make the dream come to true, Carte Blanche Travel is proud to present Tortilis Camp. At the foot of the majestic peak, Tortilis is the perfect base camp. 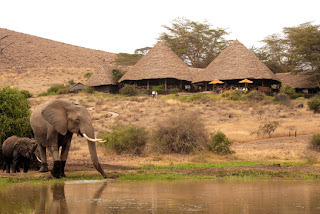 And to make it even more perfect, the camp lays right at the heart of the famous Amboseli National Park. The park is home to thousands of Africa’s greatest animals and is considered the best place on the continent to observe free-ranging elephants. It is also home to a spectacular diversity of birdlife. Tortilis Camp is multi-award winning ecotourism lodge, collecting accolades from the likes of Condé Nast Traveller. It offers some of the most stunning sights in Africa: The falling sunset across the peaks of Mt Kilimanjaro and Mt Meru in Tanzania is unrivalled by any other place. The food is unbeatable too: Chefs use home-grown ingredients and dish together the very best of safari dining. All construction is of local natural materials and thatched roofs. The tents are large and spacious, with king or twin beds and elegant en suite bathrooms. The main lounge, bar and dining area is exquisitely built with local skill. Don’t miss out on the dream! See Carte Blanche Travel for further details and contact us on telephone: +44 (0) 20 7376 1950 or by email: info@carteblanchetravel.com, and make your booking today!